A Healthy Mouth and a Healthy Mind! Rx for Reading is proud to support the work of Infant Oral Health, a community outreach program of the UDM School of Dentistry Pediatric Dental Clinic. This collaboration helps spread the message that literacy and dental hygiene are both key to children’s health. 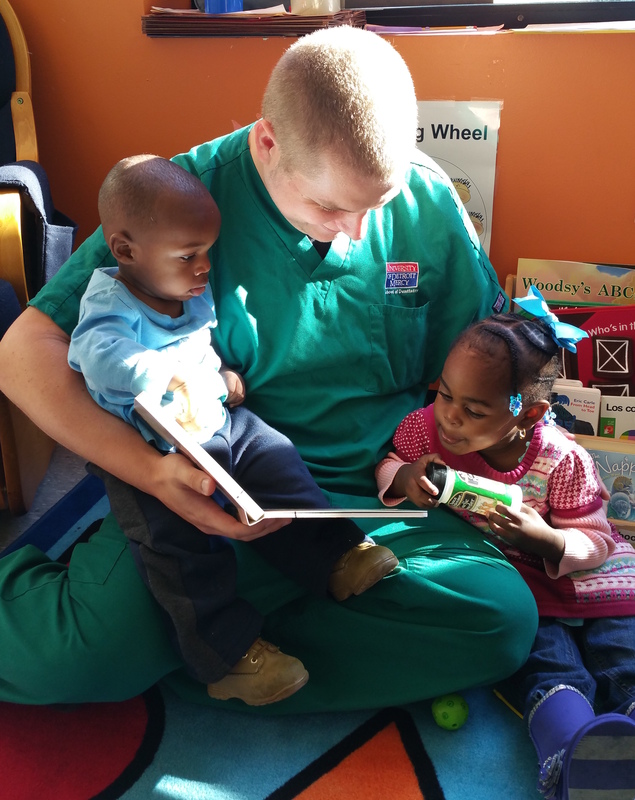 UDM senior dental student David Posthumus reads with Julius and Ahlinius Grant. Since 2006, Clinical Associate Professor Carolynn Zeitz, RDH, BS, RDA, MA has been taking groups of University of Detroit Mercy senior dental students to Head Start and Early Head Start programs to perform dental exams on children ages 4 months to 4 years of age and talk with the kids about good dental health. Now those kids also get to read with the dental students and take home a brand new book from Rx for Reading! Since 2014, Rx for Reading has distributed over 1,000 children’s books through the UDM Pediatric Dental Clinic. With the help of the Infant Oral Health Community Outreach Program, we will be able to help foster a lifelong love of reading for even more children.